Upon the death of Pope Paul I various factions contended to secure the appointment of their respective candidates as pope. Constantine, although a layman, was supported by a group of Tuscan nobles, led by his brother. They secured his election by force of arms. The following spring, local authorities, with Lombard support, succeeded in deposing him. 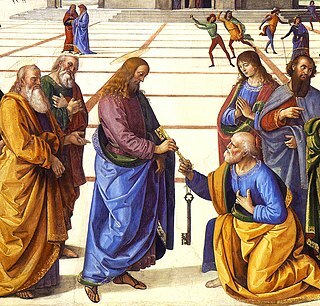 The Lombards then attempted to install their own candidate, a priest named Philip. He, in turn, was overthrown the following day by the local authorities who then elected the churchman Stephen. For a short time Constantine retained some support outside the city, which resulted in armed conflict. The supporters of Stephen had the imprisoned Constantine blinded, which, it seems to be generally allowed, Stephen was unable to hinder. After which Constantine was held in close confinement in a monastery. Pope Paul I was Pope from 29 May 757 to his death in 767. He first served as a Roman deacon and was frequently employed by his brother, Pope Stephen II, in negotiations with the Lombard kings. Antipope Philip was an antipope who held office for just one day, on July 31, 768. Pope Stephen III was the Pope from 7 August 768 to his death in 772. Constantine was born into a noble Roman family in Nepi near Viterbo. He was one of four brothers, of which the most prominent was Toto of Nepi. Toto, the papal governor and self-styled "Duke" of Nepi, began to position himself to take advantage of the expected death of Pope Paul I, and elevate his own candidate onto the papal throne. Christophorus, the Primicerius of the notaries, forced Toto to take an oath to respect the traditional clerical method of papal elections. Toto, however, having retired to his estates in Nepi, with the help of Constantine and his other brothers collected troops from his duchy and other parts of Tuscany, in addition to arming a group of peasants to swell the numbers. Nepi is a town and comune in the province of Viterbo, Lazio, central Italy. The town lies 30 kilometres (19 mi) southeast of the city of Viterbo and about 13 kilometres (8 mi) southwest from Civita Castellana. Viterbo is an ancient city and comune in the Lazio region of central Italy, the capital of the province of Viterbo. Porta San Pancrazio is one of the southern gates of the Aurelian walls in Rome (Italy). 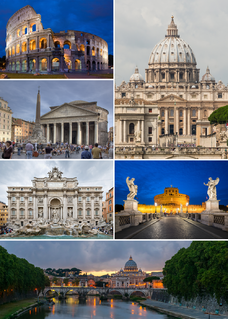 Santi Dodici Apostoli, commonly known simply as Santi Apostoli, is a 6th-century Roman Catholic parish and titular church and minor basilica in Rome, Italy, dedicated originally to St. James and St. Philip whose remains are kept here, and later to all Apostles. 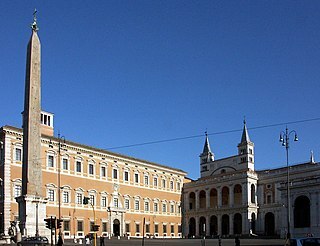 Today, the basilica is under the care of the Conventual Franciscans, whose headquarters in Rome is in the adjacent building. Canon law is a set of ordinances and regulations made by ecclesiastical authority, for the government of a Christian organization or church and its members. It is the internal ecclesiastical law, or operational policy, governing the Catholic Church, the Eastern Orthodox and Oriental Orthodox churches, and the individual national churches within the Anglican Communion. The way that such church law is legislated, interpreted and at times adjudicated varies widely among these three bodies of churches. In all three traditions, a canon was originally a rule adopted by a church council; these canons formed the foundation of canon law. The Roman people were then required to take an oath of fidelity to Constantine, who again forced George of Praeneste, together with bishops Eustratius of Albano and Citonatus of Porto, to consecrate him as Bishop of Rome on 5 July 767. In the meantime, opposition to the antipope was being led by Christophorus, the Primicerius, and his son Sergius, the treasurer of the Roman church. Noting, however, that their lives were in danger, they fled for sanctuary to St. Peter’s Basilica, where they remained until April 768. The Latin term primicerius, hellenized as primikērios, was a title applied in the later Roman Empire and the Byzantine Empire to the heads of administrative departments, and also used by the Church to denote the heads of various colleges. Whilst Constantine was in prison, there was an attempt to install another antipope, Philip, followed by the election of Pope Stephen III. After his election, followers of the new pope began attacking key members of Constantine’s regime, including Bishop Theodore, the Vice-dominus and Constantine’s brother, Passivus, both of whom were blinded. Constantine was taken from prison, put on a horse and driven through the city on top of a woman’s saddle, with heavy weights attached to his feet, among jeering crowds. He was then imprisoned in the monastery of San Saba. 1 2 3 4 Mann, 1903, pg. 362. 1 2 3 4 DeCormenin, 1857, pg. 196. 1 2 3 4 Mann, 1903, pg. 363. 1 2 3 4 Mann, 1903, pg. 366. 1 2 Mann, 1903, pg. 364. 1 2 Mann, 1903, pg. 367. 1 2 Mann, 1903, pg. 370. 1 2 3 Mann, 1903, pg. 371. 1 2 3 Mann, 1903, pg. 373. Pope Gregory II was Pope from 19 May 715 to his death in 731. His defiance of the Byzantine emperor Leo III the Isaurian as a result of the iconoclastic controversy in the Eastern Empire prepared the way for a long series of revolts, schisms and civil wars that eventually led to the establishment of the temporal power of the popes. Pope Gregory IV was Pope from October 827 to his death in 844. His pontificate was notable for the papacy’s attempts to intervene in the quarrels between the emperor Louis the Pious and his sons. It also saw the breakup of the Carolingian Empire in 843. Pope Stephen IV was Pope from June 816 to his death in 817. Pope Sergius III was Pope from 29 January 904 to his death in 911. He was pope during a period of feudal violence and disorder in central Italy, when warring aristocratic factions sought to use the material and military resources of the Papacy. Because Sergius III had reputedly ordered the murder of his two immediate predecessors, Leo V and Christopher, and allegedly fathered an illegitimate son who later became pope, his pontificate has been variously described as "dismal and disgraceful", and "efficient and ruthless". Pope Valentine was Pope for two months in 827. Pope Leo V was Pope from July 903 to his death in 904. He was pope during the period known as the Saeculum obscurum. He was thrown into prison in September 903 by the Antipope Christopher, and was probably killed at the start of the pontificate of Pope Sergius III. If his deposition is not considered valid, then his papacy may be considered to have ended with his death in 904. Pope John XIII was Pope from 1 October 965 to his death in 972. His pontificate was caught up in the continuing conflict between the Emperor, Otto I, and the Roman nobility. Pope John X was Pope from March 914 to his death in 928. A candidate of the Counts of Tusculum, he attempted to unify Italy under the leadership of Berengar of Friuli, and was instrumental in the defeat of the Saracens at the Battle of Garigliano. He eventually fell out with Marozia, who had him deposed, imprisoned, and finally murdered. John’s pontificate occurred during the period known as the Saeculum obscurum. Humbert of Silva Candida, O.S.B., also known as Humbert of Moyenmoutier, was a French Benedictine abbot and later a cardinal. It was his act of excommunicating the Patriarch of Constantinople Michael I Cerularius in 1054 which is generally regarded as the precipitating event of the Great Schism between the Roman Catholic Church and the Eastern Orthodox Churches. Alberic I was the Lombard duke of Spoleto from between 896 and 900 until 920, 922, or thereabouts. He was also Margrave of Camerino, and the son-in-law of Theophylact of Tusculum, the most powerful man in Rome. Toto was the self-styled duke of Nepi, the leading magnate of Etruria, who staged a coup d'état in Rome in 767. He became Duke of Rome for a year until his death. The principal sources documenting his takeover are the vita of Pope Stephen III in the Liber Pontificalis and a surviving deposition of the primicerius Christopher from 769, preserved in a ninth-century manuscript of Verona, the Depositio Christophori. 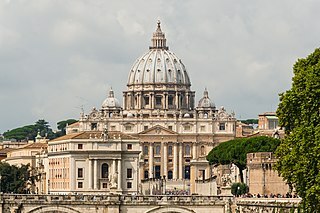 The Synods of Rome in 731 were two synods held in St. Peter’s Basilica in the year 731 under the authority of Pope Gregory III to defend the practice of Icon veneration.